There's an exciting new contest at the Dallara IndyCar Factory! 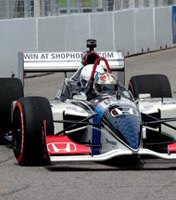 $10 for a $1,000 Ultimate Drive & Ride Experience at the Indianapolis Motor Speedway? Read more to find out how you can Drive-to-Win! Each $10 admission (18 and older) receives a drive in our designated simulator, their lap is recorded, and the person with the fastest recorded lap time of the month receives an Ultimate Drive & Ride Experience at the Indianapolis Motor Speedway! Each additional turn in the simulator is only $5 and you can pay-to-play as many times as you want! To learn more about the Ultimate Drive & Ride Experience provided by the IndyCar Experience just visit, Ultimate Drive & Ride Experience. Visit us Monday - Saturday, from 10:00 AM - 6:00 PM, and ask the front desk how you Drive-to-Win! The fastest laps, and monthly winners, will be displayed on this page. Check in regularly to see if you're still in the running or if you've already won! *Must be 18 or older to win. You are only eligible to win one time per calendar year.